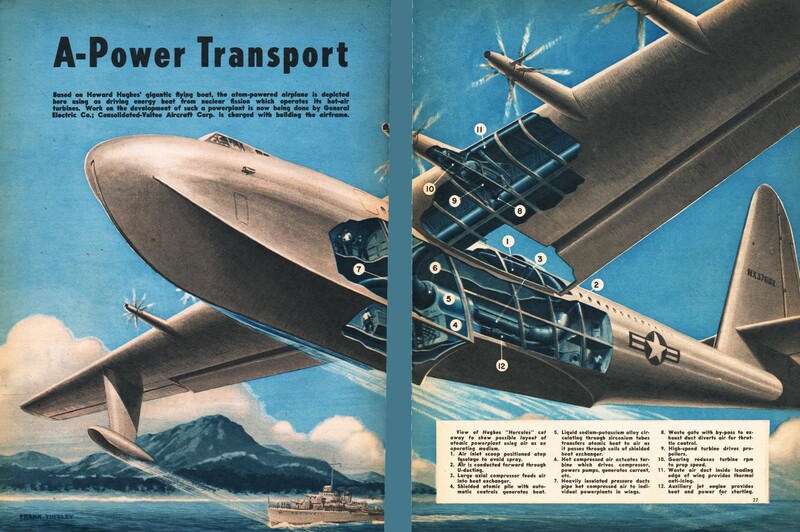 Atomic-powered aircraft was another dream of mid-last-century visionaries. It was the post World War II era where, following the demonstration of nuclear energy's awesome capacity demonstrated in Japan, plans were being made to harness its capacity for peaceful uses. Large scale atomic power electricity and steam generation stations were being designed and built. So, too, were personal nuclear power packs, atomic-powered car, boats, submarines, airplanes, rockets, and trains envisioned. Unfortunately, designers soon learned that safe containment of the fuel made small form factor generators impractical. America's first nuclear power station, Shippingport Atomic Power Station in Pennsylvania, came online in 1957. Unfortunately, a few accidents in power stations has spooked the public into rejecting what is presently the only pollution-free, compact option for electric power generation. Photovoltaic array and wind turbine farms are not pollution-free in their manufacturing and construction, and disturb huge amounts of wildlife and land. We still hold out hope for nuclear fusion electric power generators (the tokamak). Based on Howard Hughes' gigantic flying boat, the atom-powered airplane is depicted here using as driving energy heat from nuclear fission which operates its hot-air turbines. 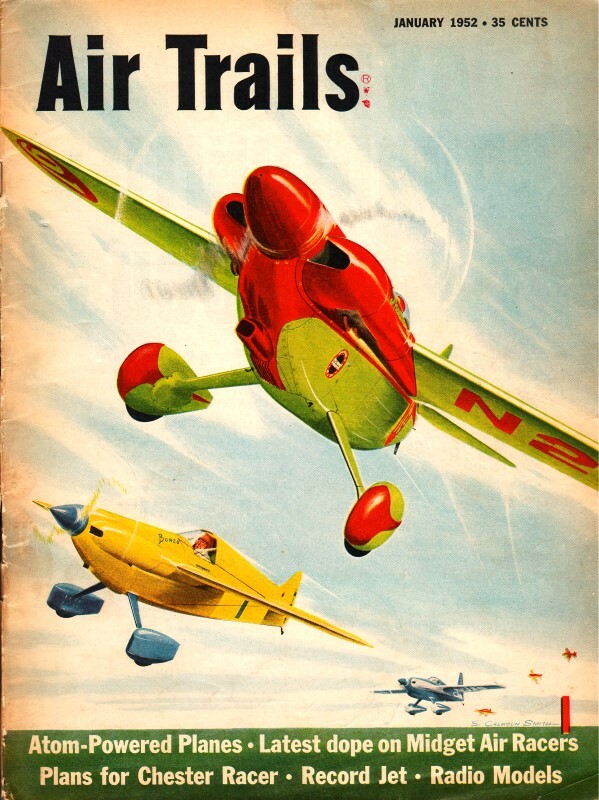 Work on the development of such a powerplant is now being done by General Electric Co.; Consolidated-Vultee Aircraft Corp. is charged with building the airframe. View of Hughes "Hercules" cut away to show possible layout of atomic powerplant using air as an operating medium. 1. Air inlet scoop positioned atop fuselage to avoid spray. 2. Air is conducted forward through U-ducting. 3. Large axial compressor feeds air into heat exchanger. 4. Shielded atomic pile with automatic controls generates heat. 5. Liquid sodium-potassium alloy circulating through zirconium tubes transfers atomic heat to air as it passes through coils of shielded heat exchanger. 6. Hot compressed air actuates turbine which drives compressor, powers pumps, generates current, etc. 7. Heavily insulated pressure ducts pipe hot compressed air to individual powerplants in wings. 8. Waste fate with by-pass to exhaust duct diverts air for throttle control. 9. High-speed turbine drives propellers. 110. Gearing reduces turbine rpm to prop speed. 12. Auxiliary jet engine provides heat and power for starting.